I dispatched an express this morning to Captain Lewis at St. Louis. All our provisions, goods, and equipage on board of a boat of 22 oars [party], a large pirogue of 71 oars [in which 8 French], a second pirogue of 6 oars [soldiers], complete with sails, &c. Men completed with powder cartridges and 100 balls each, all in health and readiness to set out. (The words and phrases in brackets did not appear in the original journals. They represent additions or corrections made by several people between 1806 and the present, including Clark himself, who edited the journals before the first publication. Words and phrases in parentheses were in parentheses in the journals as originally written.) Boats and everything complete, with the necessary stores of provisions and such articles of merchandise as we thought ourselves authorized to procure-though not as much as I think necessary for the multitude of Indians through which we must pass on our road across the continent. Rained the fore part of the day. I determined to go as far as St. Charles, a French village seven leagues up the Missouri, and wait at that place until Captain Lewis could finish the business which he was obliged to attend to at St. Louis,, and join me by land from that place (24 miles). I calculated that if any alterations in the loading of the vessels or other changes were necessary, they might be made at St. Charles. I set out at 4 o'clock, P.M., in the presence of many of the neighboring inhabitants and proceeded under a gentle breeze up the Missouri to the upper point of the first island, 4 miles, and camped on the island. It rained during the greater part of last night and continued until 7 o'clock A.M., after which the party proceeded. The barge ran foul there several times on logs, and in one instance it was with much difficulty they could get her off. Happily no injury was sustained, though the barge was several minutes in imminent danger. This was caused by her being too heavily laden in the stern. Persons accustomed to the navigation of the Missouri, and the Mississippi also, below the mouth of this river, uniformly take the precaution to load their vessels heaviest in the bow when they ascend the stream, in order to avoid the danger incident to running foul of the concealed timber, which lies in great quantities in the beds of these rivers. Note: The commanding officer is fully assured that every man of his detachment will have a true respect for his own dignity and not make it necessary for him to leave St. Charles for a more retired situation [The orderly book was a record kept in each command of all written orders]. A fair day. Compelled to punish for misconduct. Several Kickapoo Indians visit me today. George Drouilliard arrived. A sergeant and four men of the party destined for the Missouri Expedition will convene at 11 o'clock today on the quarterdeck of the boat and form themselves into a court-martial, to hear and determine (in behalf of the captain), the evidences adduced against William Warner & Hugh Hall, for being absent last night without leave, contrary to orders; and John Collins, first for being absent without leave; second, for behaving in an unbecoming manner at the ball last night; third, for speaking in a language last night after his return tending to bring into disrespect the orders of the commanding officer. We set out early, ran on a log, and were detained one hour, proceeded the course of last night two miles to the mouth of a creek on the starboard side, called Osage Woman's River, about 30 yards wide, opposite a large island and a [American] settlement. On this creek 30 or 40 families are settled. Stopped about one mile above for Captain Lewis, who had ascended the cliff which is at said cave, three hundred feet high, hanging over the waters. The water excessively swift today. We encamped below a small island in the middle of the river. Sent out two hunters. One killed a deer. Camped at the mouth of a creek called Riviere la Charrette, above a small French village of seven houses and as many families settled at this place to be convenient to hunt and trade with the Indians. Here we met M. Loisel, immediately down from the Cedar Island, in the country of the Sioux, 400 leagues up. He gave us a good deal of information. At 1 o'clock we brought to, two chaussies, one loaded with furs and peltries, the other with buffalo grease and tallow. We purchased 300 pounds of grease; and, finding that old Mr. Dorion was of the party, we questioned him until it was too late to go further. Concluding to take old Mr. Dorion back as far as the Sioux nation, with a view to get some of their chiefs to visit the President of the United States-this man being a very confidential friend of those people, he having resided with the nation twenty-odd years. George Drouilliard, our hunter, and one man came in with two deer and a bear, also a young horse they had found in the prairie. This horse had been in the prairie a long time and is fat. I suppose he has been left by some war party against the Osages. The party is much afflicted with boils, and several have the dysentery. Ordered.-A court-martial will sit this day at 11 o'clock, to consist of five members, for the trial of John Collins and Hugh Hall, confined on charges exhibited against them by Sergeant Floyd, agreeable to the Articles of War.... John Collins charged with getting drunk on his post this morning out of whiskey put under his charge as sentinel, and for suffering Hugh Hall to draw whiskey out of the said barrel intended for the party. To this charge the prisoner pleaded "not guilty." The court, after mature deliberation on the evidence adduced, &c., are of opinion the prisoner is guilty of the charge exhibited against him, and do therefore sentence him to receive one hundred lashes on his bare back. Hugh Hall was brought before the court charged with taking whiskey out of a keg this morning, which whiskey was stored on the bank (and under the charge of the guard), contrary to all order, rule, or regulation. To this charge the prisoner pleaded guilty. The court find the prisoner guilty and sentence him to receive fifty lashes on his bare back. Ushered in the day by a discharge of one shot from our bow piece, proceeded on, passed the mouth of a bayou leading from a large lake on the S.S., which has the appearance of being once the bend of the river, and reaches parallel for several miles. We came to on the L.S. to refresh ourselves [the abbreviation "S.S." stands for "starboard," or the right-hand side when one is facing forward on a ship. "L.S." means "larboard," or left-hand side]. Joseph Fields got bitten by a snake, and was quickly doctored with bark by Captain Lewis. We passed a creek twelve yards wide, on the L.S., coming out of an extensive prairie reaching within two hundred yards of the river. As this creek has no name, and this being the Fourth of July, the day of the Independence of the United States, we called it "Fourth of July 1804 Creek." We dined on corn. Captain Lewis walked on shore above this creek and discovered a high mound from the top of which he had an extensive view. Three paths came together at the mound. We saw great numbers of goslings today which were nearly grown. The lake is clear and contains great quantities of fish and geese and goslings. This induced me to call it Gosling Lake. A small creek and several springs run into the lake on the east side from the hills. The land on that side is very good. Set out early. Passed some swift water which obliged us to draw up by ropes. A sand bar at the point, opposite a beautiful prairie on the S. side, called St. Michael. Those prairies on the river have very much the appearance of farms from the river, divided by narrow strips of woodland, which woodland is situated on the runs leading to the river. Passed a bluff of yellow clay above the prairie. Saw a large rat on the bank. Killed a wolf. One man very sick-struck with the sun. Captain Lewis bled him and gave niter, which has revived him much. Set out early. Passed a small creek and two small islands on the S.S. Five men sick today with violent headache, &c. We made some arrangements as to provisions and messes. Came to for dinner at the lower point of a very large island situated near the S.S. After a delay of two hours we passed a narrow channel 45 to 80 yards wide five miles to the mouth of Nodaway River. In order to ensure a prudent and regular use of all provisions issued to the crew of the bateaux in future, as also to provide for the equal distribution of the same among the individuals of the several messes, the commanding officers do appoint the following persons to receive, cook, and take charge of the provisions which may from time to time be issued to their respective messes, viz., John B. Thompson to Sergeant Floyd's mess, William Warner to Sergeant Ordway's mess, and John Collins to Sergeant Pryor's mess. These Superintendents of Provision are held immediately responsible to the commanding officers for a judicious consumption of the provision which they receive; they are to cook the same for their several messes in due time, and in such manner as is most wholesome and best calculated to afford the greatest proportion of nutriment; in their mode of cooking they are to exercise their own judgment. They shall also point out what part, and what proportion of the mess provisions are to be consumed at each stated meal, i.e., morning, noon, and night. Nor is any man at any time to take or consume any part of the mess provisions without the privity, knowledge, and consent of the superintendent. The superintendent is also held responsible for all the cooking utensils of his mess. In consideration of the duties imposed by this order on Thompson, Warner, and Collins, they will in future be exempt from guard duty, though they will still be held on the roster for that duty, and their regular tour shall be performed by someone of their respective messes; they are exempted also from pitching the tents of the mess, collecting firewood, and forks, poles, &c. for cooking and drying such fresh meat as may be furnished them; those duties are to be also performed by the other members of the mess. One man sent back to the river we passed last night to blaze a tree with a view to notify the party on shore of our passing. Set out and passed the head of the island which was situated opposite to our camp last night-a sand bar at the head. Opposite this island a creek or bayou comes in from a large pond on the starboard side. As our flanking party saw great numbers of pike in this pond, I have laid it down with that name annexed. At 8 o'clock the wind shifted from the N.E. to the S.W. and it commenced raining. At six miles, passed the mouth of the creek on the L.S. called Montain's Creek. About two miles above are some cabins where our bowman and several Frenchmen camped two years ago. Passed an island on the S.S. in a bend of the river opposite some cliffs on the L.S. The wind shifted to the N.W. opposite this island, and on the L. side Wolf River comes in. This river is about 60 yards wide and heads with the waters of the Kansas, and is navigable for pirogues "some distance up." Camped at a point on the L.S. opposite the head of the island. Our party was encamped on the opposite side. Their not answering our signals caused us to suspect the persons camped opposite to us were a war party of Sioux. We fired the bow piece to alarm the party on shore, all prepared to oppose if attacked. Set out early this morning and crossed the river with a view to see who the party was that camped on the other side. We soon discovered them to be our men. Proceeded on past a prairie on the L.S. at 4 miles. Passed a creek L.S. called Pape's Creek after a man who killed himself at its mouth. This creek is 15 yards wide. Dined on an island called Solomon's Island. Delayed three hours on this island to recruit the men. Opposite on the L.S. is a beautiful bottom plain of about 2,000 acres covered with wild rye and potatoes (ground apple), intermixed with the grass. Set out early. Passed a willow island in a bend on the S.S. Back of this island a creek comes in, called by the Indians Tarkio. I went on shore above this creek and walked up parallel with the river about half a mile distant. The bottom I found low and subject to overflow. Still further out, the undergrowth and vines were so thick that I could not get through with ease. After walking about three or four miles, I observed a fresh horse track; where he had been feeding I turned my course to the river and pursued the track, and found him on a sand beach. This horse probably had been left by some party of Ottawas, hunters who wintered or hunted in this quarter last fall or winter. I joined the party on a large sand island immediately opposite the mouth of Nemaha River, at which place they had camped. This island is sand, about half of it covered with small willows of two different kinds, one narrow and the other a broad leaf. Several hunters sent out today on both sides of the river. Seven deer killed today-Drouilliard killed six of them. Made some lunar observations this evening. Concluded to delay here today with a view of taking equal altitudes and making observations as well as refreshing our men, who are much fatigued. After an early breakfast I, with five men in a pirogue, ascended the riverNemaha about three miles to the mouth of a small creek on the lower side. Here I got out of the pirogue. After going to several small mounds in a level plain, I ascended a hill on the lower side. On this hill, several artificial mounds were raised; from the top of the highest of those mounds I had an extensive view of the surrounding plains, which afforded one of the most pleasing prospects I ever beheld: under me a beautiful river of clear water about 80 yards wide, meandering through a level and extensive meadow, as far as I could see-the prospect much enlivened by the few trees and shrubs which border the bank of the river, and the creeks and runs falling into it. The bottom land is covered with grass about 41/2 feet high, and appears as level as a smooth surface. The second bottom [the upper land] is also covered with grass and rich weeds and flowers, interspersed with copses of the Osage plum, on the rising lands. Small groves of trees are seen, with numbers of grapes and a wild cherry resembling the common wild cherry, only larger, and growing on a small bush on the tops of those hills in every direction. I observed artificial mounds (or as I may more justly term graves) which to me is a EM evidence of this country being once thickly settled. (The Indians of the Missouris still keep up the custom of burying their dead on high ground.) After a ramble of about two miles, I returned to the pirogue and descended down the river. Gathered some grapes, nearly ripe. On a sandstone bluff about 1/4 of a mile from its mouth on the lower side, I observed some Indian marks. Went to the rock which jutted over the water and marked my name 8 and the day of the month and year. Tried a man for sleeping on his post, and inspected the arms, ammunition, &c., of the party. Found all complete. Took some lunar observations. Three deer killed today. A court-martial consisting of the two commanding officers will convene this day at one o'clock, P.M., for the trial of such prisoners as may be brought before them. One of the court will act as judge advocate. The commanding officers, Captains M. Lewis and W. Clark, constituted themselves a court-martial for the trial of such prisoners as are guilty of capital crimes, and under the rules and articles of war punishable by death. To this charge the prisoner pleads guilty of lying down, and not guilty of going to sleep. The court, after duly considering the evidence adduced, are of the opinion that the prisoner Alexander Willard is guilty of every part of the charge exhibited against him. It being a breach of the rules and articles of war (as well as tending to the probable destruction of the party) do sentence him to receive one hundred lashes on his bare back, at four different times in equal proportion; and order that the punishment commence this evening at sunset, and continue to be inflicted, by the guard, every evening until completed. Set out at sunrise, and proceeded on under a gentle breeze. At two miles, passed the mouth of a small river on the S.S. called by the Indians Tarkio. A channel running out of the river three miles above (which is now filled up with sand) runs into this creek, and formed an island, called St. Josephs. Several sand bars parallel to each other above. In the first bend to the left is situated a beautiful and extensive plain, covered with grass resembling timothy, except the seed which resembles flaxseed. This plain also abounds in grapes of different kinds, some nearly ripe. I killed two goslings nearly grown. Several others killed and caught on shore, also one old goose with pinfeathers. She could not fly. At about 12 miles, passed an island situated in a bend on the S.S.-above this island is a large sand bar covered with willows. The wind from the south. Camped on a large sand bar making out from the L side, opposite a high, handsome prairie, the hills about 4 or 5 miles on starboard side. Some hard showers of rain this morning prevented our setting out until seven o'clock. At half-past seven, the atmosphere became suddenly darkened by a black and dismal-looking cloud. At the time we were in a situation not to be bettered, near the upper point of the sand island, on which we lay, and [on] the opposite shore, the bank was falling in and lined with snags as far as we could see down. In this situation the storm, which passed over an open plain from the N.E., struck the oar boat on the starboard quarter, and would have thrown her up on the sand island dashed to pieces in an instant, had not the party leaped out on the leeward side, and kept her off with the assistance of the anchor and cable, until the storm was over. The waves washed over her windward side and she must have filled with water if the lockers, which are covered with tarpaulins, had not thrown off the water and prevented any quantity getting into the bilge of the boat. In this situation we continued about 40 minutes, when the storm suddenly ceased and the river became instantaneously as smooth as glass. The two pirogues, during this storm, were in a similar situation with the boat about half a mile above. The wind shifted to the S.E., and we sailed up past a small island situated on the S.S., and dined, and continued two hours, men examined their arms. About a mile above this island we passed a small trading fort on the S.S., where Mr. Bennet of St. Louis traded with the Otos and Pawnees two years. I went on shore to shoot some elk on a sand bar to the L.S. I fired at one but did not get him. Several men unwell with boils, felons, &c. The river falls a little. A heavy fog this morning prevented our setting out before seven o'clock. At nine I took two men and walked on the L.S. I crossed three beautiful streams of running water heading into the prairies. On those streams the land very fine, covered with pea vine and rich weed. The high prairies are also good land, covered with grass, entirely void of timber, except what grows on the water. I proceeded on through those prairies several miles to the mouth of a large creek on the L.S. called Little Nemaha. This is a small river. A fair morning. Set a party to look for timber for oars; two parties to hunt. At eleven o'clock sent off George Drouilliard and Peter Cruzat with some tobacco to invite the Otos if at their town, and Pawnees if they saw them, to come and talk with us at our camp, &c., &c. (At this season, the Indians on this river are in the prairies hunting the buffalo, but some signs of hunters near this place and the plains being on fire near their towns induce a belief that they-this nation- have returned to get some green corn or roasting ears.) Raised a staff, sunned and dried our provisions, &c. I commence copying a map of the river below to send to the President, United States. Five deer killed today. One man with a tumor 2 on his breast. Prepared our camp. The men put their arms in order. Wind hard this afternoon from the N.W. A fair day. The wind blows hard from the south. The breezes, which are very frequent in this part of theMissouri, are cool and refreshing. Several hunters out today, but, as game of all kinds is scarce, only two deer were brought in. I am much engaged drawing off a map. Captain Lewis also much engaged in preparing papers to send back by a pirogue, which we intended to send back from the River Platte. Observations at this place makes the latitude 41° 3' 19" North. This evening Goodrich caught a white catfish, its eyes small and tail much like that of a dolphin. The wind blustering and hard from the south all day, which blew the clouds of sand in such a manner that I could not complete my plan in the tent. The boat rolled in such a manner that I could do nothing in that, and was compelled to go to the woods and combat the mosquitoes. I opened the tumor of a man, on the left breast, which discharged half a pint. Five beaver caught near the camp, the flesh 3 of which we made use of. This evening we found very pleasant. Only one deer killed today. The country back from camp on the S.S. is a bottom about 5 miles wide-one-half the distance woods and the balance plain high and dry. The opposite side, a high hill-about 170 foot-rock foundation covered with timber. Back and below is a plain. Sent a Frenchman, La Liberte, with the Indian to Otos' camp to invite the Indians to meet us on the river above. A dark, rainy morning; wind from the W.N.W., rained all the last night. Set out at 5 o'clock opposite the island-the bend to the right or S.S. within 20 feet of Indian Knob Creek. The water of this creek is 5 feet higher than that of the river. Past the island we stopped to dine under some high trees near the high land on the L.S. In a few minutes, caught three very large catfish, one nearly white. Those fish are in great plenty on the sides of the river and very fat. A quart of oil came out of the surplus fat of one of those fish. Set out this morning early. Proceeded on to a clear open prairie on the L.S. on a rise of about 70 feet higher than the bottom, which is also a prairie (both forming bluffs to the river) of high grass and plum bush, grapes, &c., and situated above high water. In a small grove of timber at the foot of the rising ground, between those two prairies, and below the bluffs of the high prairie, we came to and formed a camp, intending to wait the return of the Frenchman and Indians. The white horse which we found near the Kansas River died last night. Posted out our guard, and sent out four men. Captain Lewis and I went up the bank and walked a short distance in the high prairie. This prairie is covered with grass ten or twelve inches in height; soil of good quality; and at the distance of about a mile further back, the country rises about 80 or 90 feet higher, and is one continued plain as far as can be seen. From the bluff on the second rise immediately above our camp, the most beautiful prospect of the river, up and down, and the country opposite, presented itself, which I ever beheld. A fair day. Three hunters out. Took meridian altitude, made the latitude 41° 18' 1 5/10"N. R. and Jo. Fields returned to camp; they killed three deer. The horses strayed off last night. Drouilliard killed a buck, one inch of fat on the ribs. R. and Jo. Fields returned without any meat, having been in pursuit of the horses. The Indians not yet arrived. Caught a young beaver alive which is already quite tame. Caught a buffalo fish. The evening very cool, the mosquitoes are yet troublesome. A fair morning. Dispatched two men after the horses lost yesterday. One man back to the place from which the messenger was sent for the Otos, to see if any Indians were, or had been, there since our departure. He returned and informed that no person had been there since we left it. The prairie which is situated below our camp is above the high-water level and rich, covered with grass from 5 to 8 feet high, interspersed with copses of hazel, plums, currants, like those of the U.S.
A very pleasant breeze from the S.E. The two men, Drouilliard and Colter, returned with the horses loaded with elk. Those horses they found about 12 miles in a southerly direction from camp. The country through which they passed is similar to what we see from camp. One beaver and a foot [of a beaver caught in a trap] caught this morning. At sunset, Mr. Fairfong [Oto interpreter resident with them] and a party of the Oto and Missouri Nations came to camp. Among those Indians, six were chiefs (not the principal chiefs). Captain Lewis and myself met those Indians and informed them we were glad to see them, and would speak to them tomorrow. Sent them some roasted meat, pork, flour and meal. In return, they sent us watermelons. Every man on his guard and ready for anything. Made up a small present for those people in proportion to their consequence; also a package with a medal to accompany a speech for the grand chief. After breakfast, we collected those Indians under an awning of our mainsail. In presence of our party, paraded, and delivered a long speech to them, expressive of our journey, the wishes of our government, some advice to them, and directions how they were to conduct themselves. The principal chief for the nation being absent, we sent him the speech, flag, medal, and some clothes. After hearing what they had to say, delivered a medal of second grade to one for the Otos and one for the Missouris, and presented four medals of a third grade to the inferior chiefs-two for each tribe. Those two parts of nations, Otos and Missouris, now residing together are about 250 men, the Otos composing 2/3 and the Missouris 1/3 part. Those chiefs all delivered a speech, acknowledging their approbation to the speech and promising to pursue the advice and directions given them, that they were happy to find that they had fathers which might be depended on, &c.
We gave them a canister of powder and a bottle of whiskey, and delivered a few presents to the whole, after giving a breech cloth some paint, gartering, and a medal to those we made chiefs. After Captain Lewis's shooting the air gun a few shots (which astonished those natives), we set out, and proceeded on five miles, on a direct line past a point on the S.S. and around a large sand bar on the L.S., and camped on the upper point. The mosquitoes excessively troublesome this evening. Great appearance of wind and rain to the N.W. We prepare to receive it. The man Liberte whom we sent for the Otos has not come up. He left the Otos' town one day before the Indians. This man has either tired his horse, or lost himself in the plains. Some Indians are to hunt for him. Set out early. Great appearance of wind and rain. I have observed that thunder and lightning is not as common in this country as it is in the Atlantic states. Snakes are not plenty; one was killed today, large, and resembling the rattlesnake, only something lighter. I walked on shore this evening, S.S. In pursuing some turkeys, I struck the river twelve miles below within 370 yards. The high water passes through this peninsula, and agreeable to the customary changes of the river, I should conclude that in two years the main current of the river will pass through. In every bend the banks are falling in from the current being thrown against those bends by the sand points which enlarge, and the soil, I believe, from unquestionable appearances of the entire bottom, from one hill to the other, being the mud or ooze of the river at some former period, mixed with sand and clay, easily melts and slips into the river, and the mud mixes with the water, and the sand is washed down and lodges on the points. Great quantities of grapes on the banks. I observe three different kinds, at this time ripe; one of the number is large and has the flavor of the purple grape. Camped on the S.S. The mosquitoes very troublesome. The man who went back after his knife has not yet come up. We have some reasons to believe he has deserted. Last night at 8 o'clock a storm from the N.W. which lasted 3/4 of an hour. Set out late this morning. Wind from the north. At one o'clock, dispatched George Drouilliard, R. Fields, William Bratton, and William Labiche back after the deserter, Reed, with order if he did not give up peaceably to put him to death; to go to the Otos' village and inquire for La Liberte, and bring him to the Maha village, also with a speech on the occasion to the Otos and Missouris, and directing a few of their chiefs to come to the Mahas, and we would make a peace between them and the Mahas and Sioux, a string of wampum and a carrot of tobacco. Proceeded on and camped on the S.S.
Set out this morning at the usual time. At two miles, passed a bend to L.S. choked up with snags. Our boat ran on two, in turning to pass through. We got through with safety. Captain Lewis took median altitude of the sun, made it 56° 9' 00", latitude 41 ° 42' 34". And I took one man and went on shore. The man killed an elk. I fired four times at one and did not kill him; my ball being small, I think, was the reason. The mosquitoes so bad in the prairies that with the assistance of a bush I could not keep them out of my eyes. The boat turned several times today on sand bars. In my absence, the boat passed an island two miles above the Little Sioux River. On the upper point of this island, some hundreds of pelicans were collected. They left three fish on the sand which were very fine. Captain Lewis killed one and took his dimensions. I joined the boat and we camped on the S.S. Worthy of remark that snakes are not plenty in this part of the Missouri. About daylight this morning a hard wind from the N.W., with some rain. Proceeded on around the right of the island. A hard wind accompanied with rain from the S.E. After the rain was over, Captain Lewis, myself, and ten men ascended the hill on the L.S. (under which there were some fine springs) to the top of a high point where the Maha king Blackbird was buried four years ago. [Died of smallpox.] A mound of earth about 12 feet diameter at the base and 6 feet high is raised over him surfed, and a pole 8 feet high in the center. On this pole we fixed a white flag, bound with red, blue, and white. This hill about 300 feet above the water forming a bluff, between that and the water, of various heights from 40 to 150 feet-yellow soft sandstone. From the top of this knoll, the river may be seen meandering for 60 or 70 miles. A fine morning. Wind from the S.E. The men sent to the Maha town last evening have not returned. We conclude to send a spy to know the cause of their delay. At about 12 o'clock, the party returned and informed us that they could not find the Indians, nor any fresh sign. Those people have not returned from their buffalo hunt. Those people, having no houses, no corn or anything more than the graves of their ancestors to attach them to the old villager continue in pursuit of the buffalo longer than others who have greater attachments to their native villages. The ravages of the smallpox, which swept off-about four years ago-400 men and women and children in proportion, reduced this nation not exceeding 300 men, and left them to the insults of their weaker neighbors, which before were glad to be on friendly terms with them. I went with ten men to a creek dammed by the beavers about halfway to the village. With some small willows and bark we made a drag, and hauled up the creek, and caught 318 fish of different kinds, i.e., pike, bass, salmon, perch, red horse, small cat, and a kind of perch called silverfish on the Ohio. I caught a shrimp precisely of shape, size, and flavor of those about New Orleans and the lower part of the Mississippi, in this creek, which is only the pass or straight from [one] beaver pond to another and is crowded with large mussels. Very fat ducks, plover of different kinds, are on those ponds as well as on the river. In my absence, Captain Lewis sent Mr. Dorion, the Sioux interpreter, and three men to examine a fire which threw up an immense smoke from the prairies on the N.E. side of the river, and at no great distance from camp. The object of this party was to find some bands of Sioux, which the interpreter thought were near the smoke, and get them to come in. In the evening this party returned, and informed that the fire arose from some trees which had been left burning by a small party of Sioux who had passed [by that place] several days. The wind, setting from that point, blew the smoke from that point over our camp. Our party all in health and spirits. The men sent to the Otos and in pursuit of the deserter, Reed, have not yet returned or joined our party. A very cool morning, the wind as usual from the N.W. Captain Lewis took twelve men and went to the pond and creek between camp and the old village, and caught upwards of 800 fine fish: 79 pike, 8 salmon resembling trout [8 fish resembling salmon trout], 1 rock, 1 flat back, 127 buffalo and red horse, 4 bass, and 490 cats, with many small silver fish and shrimp. I had a mast made and fixed to the boat today. The party sent to the Otos not yet joined us. The wind shifted around to the S.E. Every evening a breeze rises which blows off the mosquitoes and cools the atmosphere. A fine morning, the wind from the S.E. I collected a grass much resembling wheat in its growth, the grain like rye, and also some resembling rye and barley. A kind of timothy, the seed of which branches from the main stalk and is more like a flaxseed than that of timothy. At six o'clock this evening, Labiche, one of the party sent to the Otos, joined and informed that the party was behind with one of the deserters, M. B. Reed, and the three principal chiefs of the Nations. La Liberte they caught, but he deceived them and got away. The object of those chiefs coming forward is to make peace with the Mahas through us. As the Mahas are not at home, this great object cannot be accomplished at this time. Set the prairies on fire to bring the Mahas and Sioux if they were near, this being the usual signal. A cool evening; two beaver caught today. A fine morning. Wind from the S.E. In the after part of the day, the party with the Indians arrived. We met them under a shade near the boat, and after a short talk we gave them provisions to eat and proceeded to the trial of Reed. He confessed that he "deserted and stole a public rifle, shot-pouch, powder and ball," and requested that we would be as favorable with him as we could, consistently with our oaths, which we were, and only sentenced him to run the gauntlet four times through the party, and that each man with switches should punish him, and for him not to be considered in future as one of the party. The three principal chiefs petitioned for pardon for this man. After we explained the injury such men could do them by false representations, and explained the customs of our country, they were all satisfied with the propriety of the sentence, and were witnesses to the punishment. After which we had some talk with the chiefs about the origin of the war between them and the Mahas, &c.
Captain Lewis's birthday. The evening was closed with an extra gill of whiskey, and a dance until 11 o'clock. A fine morning. Wind from the S.E. Prepared a small present for the chiefs and warriors present. The main chief breakfasted with us and begged for a sun glass. Those people are all naked, covered only with breechclouts, blankets, or buffalo robes-the flesh side painted with different colors and figures. At ten o'clock we assembled the chiefs and warriors, nine in number, under an awning, and Captain Lewis and I explained the speech sent to the nation from the Council Bluffs by Mr. Faufon. The three chiefs and all the men or warriors made short speeches approving the advice and council their Great Father had sent them, and concluded by giving themselves some credit for their acts. We then brought out the presents and exchanged The Big Horse's medal and gave him one equal to the one sent to the Little Thief, and gave all some small articles and eight carrots of tobacco. We gave one small medal to one of the chiefs and a certificate to the others, of their good intentions. One of those Indians after receiving his certificate, delivered it again to me-The Big Blue Eyes. The chief petitioned for the certificate again. We would not give the certificate, but rebuked them very roughly for having in object goods and not peace with their neighbors. This language they did not like at first, but at length all petitioned for us to give back the certificate to The Big Blue Eyes. He came forward and made a plausible excuse. I then gave the certificate to the great chief to bestow it to the most worthy. They gave it to him. We then gave them a dram and broke up the council. The chiefs requested we would not leave them this evening. We determined to set out early in the morning. We showed them many curiosities, and the air gun, which they were much astonished at. Those people begged much for whiskey. Sergeant Floyd is taken very bad all at once with a bilious colic. We attempt to relieve him without success as yet. He gets worse and we are much alarmed at his situation. All attention to him. was fixed at the head of his grave. This man at all times gave us proof of his firmness, and determined resolution to do service to his country, and honor to himself. After paying all the honor to our deceased brother, we camped in the mouth of Floyd's River, about 30 yards wide. A beautiful evening. Set out early. Wind from the south. At three miles, we landed at a bluff where the two men sent with the horses were waiting with two deer. By examination, this bluff contained alum, copperas, cobalt, pyrites; an alum rock, soft and sand stone. Captain Lewis, in proving the quality of those minerals, was near poisoning himself by the fumes and taste of the cobalt, which had the appearance of soft isinglass. Copperas and alum are very poisonous. Above this bluff a small creek comes in from the L.S., passing under the cliff for several miles. Captain Lewis took a dose of salts to work off the effects of the arsenic. We camped on the S.S. Sailed the greater part of this day with a hard wind from the S.E. Great deal of elk sign and great appearance of wind from the N.W. Ordered a vote for a sergeant to choose one of three which may be the highest number. The highest numbers are P. Gass (had 19 votes), Bratton, and Gibson. Set out this morning very early. The two men with the horses did not come up last night. I walked on shore and killed a fat buck. J. Fields sent out to hunt; came to the boat and informed that he had killed a buffalo in the plain ahead. Captain Lewis took twelve men and had the buffalo brought to the boat. In the next bend to the S.S., two elk swam the river, and were fired at from the boat. R. Fields came up with the horses and brought two deer. One deer killed from the boat. Several prairie wolves seen today. Saw elk standing on the sand bar. The wind blew hard and raised the sands off the bar in such clouds that we could scarcely see. This sand, being fine and very light, stuck to everything it touched, and in the plain for half a mile-the distance I was out-every spire of grass was covered with sand or dirt. Some rain last night. A continuation this morning. We set out at the usual time and proceeded on the course of last night, to the commencement of a blue clay bluff 180 or 190 feet high on the L.S. Those bluffs appear to have been latterly on fire and at this time are too hot for a man to bear his hand in the earth at any depth. Great appearance of coal. An immense quantity of cobalt, or a crystalized substance which answers its description, is on the face of the bluff. Great quantities of a kind of berry resembling a currant, except double the size, and grows on a bush like a privet, and the size of a damson, deliciously flavored, and makes delightful tarts. This fruit is now ripe. I took my servant (York) and a French boy and walked on shore. Killed two buck elks and a fawn, and intercepted the boat, and had all the meat butchered and in by sunset, at which time it began to rain and rained hard. Captain Lewis and myself walked out and got very wet. A cloudy, rainy night. In my absence, the boat passed a small river, called by the Indians Whitestone River. This river is about 30 yards wide, and runs through a plain or prairie in its whole course. In a northerly direction from the mouth of this creek, in an immense plain, a high hill is situated, and appears of a conic form, and by the different nations of Indians in this quarter, is supposed to be the residence of devils: that they are in human form with remarkable large heads, and about 18 inches high, that they are very watchful, and are armed with sharp arrows with which they can kill at a great distance. They are said to kill all persons who are so hardy as to attempt to approach the hill. They state that tradition informs them that many Indians have suffered by those little people, and, among others, three Maha men fell a sacrifice to their merciless fury not many years since. So much do the Maha, Sioux, Otos, and other neighboring nations, believe this fable, that no consideration is sufficient to induce them to approach the hill. A cloudy morning. Captain Lewis and myself concluded to go and see the mound which was viewed with such terror by all the different nations in this quarter. We selected Shields, J. Fields, W. Bratton, Sergeant Ordway, J. Colter, Carr, and Corporal Warfington and Frazer, also G. Drouilliard, and dropped down to the mouth of Whitestone River, where we left the pirogue with two men; and, at 200 yards, we ascended a rising ground of about 60 feet. From the top of this high land, the country is level and open as far as can be seen, except some few rises at a great distance, and the mound which the Indians call "Mountain of little people, or spirits." This mound appears of a conic form, and is N. 20° W. from the mouth of the creek. We left the river at 8 o'clock. At 4 miles we crossed the creek, 23 yards wide, in an extensive valley, and continued on two miles further. Our dog was so heated and fatigued, we were obliged to send him back to the creek. At 12 o'clock we arrived at the hill. Captain Lewis much fatigued from heat-the day, it being very hot, and he being in a debilitated state from the precautions he was obliged to take, to prevent the effects of the cobalt and mineral substance which had like to have poisoned him two days ago. His want of water, and several men complaining of great thirst, determined us to make for the first water, which was the creek in a bend N.E. from the mound, about three miles. After a delay of about one hour and a half to recruit our party, we set out on our return down the creek through the bottom, of about one mile in width, crossed the creek three times to the place we first struck it, where we gathered some delicious fruit, such as grapes, plums, and blue currants. After a delay of an hour, we set out on our back trail, and arrived at the pirogue at sunset. We proceeded on to the place we camped last night, and stayed all night. This mound is situated on an elevated plain in a level and extensive prairie, bearing N. 20° W. from the mouth of Whitestone Creek nine miles. The base of the mound is a regular parallelogram, the long side of which is about 300 yards in length, the shorter 60 or 70 yards. From the longer side of the base, it rises from the north and south, with a steep ascent to the height of 65 or 70 feet, leaving a level plain on the top 12 feet in width and 90 in length. The north and south parts of this mound are joined by two regular rises, each in oval forms of half its height, forming three regular rises from the plain. The ascent of each elevated part is as sudden as the principal mound at the narrower sides of its base. The regular form of this hill would in some measure justify a belief that it owed its origin to the hand of man; but as the earth and loose pebbles and other substances of which it was composed bore an exact resemblance to the steep ground which borders on the creek, in its neighborhood, we concluded it was most probably the production of nature. The only remarkable characteristic of this hill, admitting it to be a natural production, is that it is insulated or separated a considerable distance from any other, which is very unusual in the natural order or disposition of the hills. The surrounding plains are open, void of timber, and level to a great extent; hence the wind, from whatever quarter it may blow, drives with unusual force over the naked plains and against this hill. The insects of various kinds are thus involuntarily driven to the mound by the force of the wind, or fly to its leeward side for shelter. The small birds, whose food they are, consequently resort in great numbers to this place in search of them-particularly the small brown martin, of which we saw a vast number hovering on the leeward side of the hill, when we approached it in the act of catching those insects. They were so gentle that they did not quit the place until we had arrived within a few feet of them. One evidence which the Indians give for believing this place to be the residence of some unusual spirits is that they frequently discover a large assemblage of birds about this mound. This is, in my opinion, a sufficient proof to produce in the savage mind a confident belief of all the properties which they ascribe to it. From the top of this mound, we beheld a most beautiful landscape. Numerous herds of buffalo were seen feeding in various directions. The plain to north, northwest, and northeast extends without interruption as far as can be seen. The boat under the command of Sergeant Pryor proceeded on in our absence (after jerking 1 the elk I killed yesterday) six miles, and camped on the larboard side. R. Fields brought in five deer. George Shannon killed an elk buck. Some rain this evening. We set the prairies on fire as a signal for the Sioux to come to the river. This morning the star called the morning star much larger than common. G. Drouilliard came up and informed that he could neither find Shannon nor horses. We sent Shields and J. Fields back to hunt Shannon and the horses, with directions to keep on the hills to the Grand Calumet above, on Riviere qui Court. We set sail under a gentle breeze from the S.E. At seven miles, passed a white clay marl or chalk bluff. Under this bluff, which is extensive, I discovered large stone much like lime, encrusted with a clear substance which I believe to be cobalt, also ore is embedded in the dark earth resembling slate, but much softer. Above this bluff, we had the prairie set on fire to let the Sioux see that we were on the river, and as a signal for them to come to it. At 2 o'clock, passed the mouth of river Jacques [or Yankton]. One Indian at the mouth of this river swam to the pirogue. We landed and two others came to us. Those Indians informed that a large camp of Sioux were on River Jacques, near the mouth. We sent Sergeant Pryor and a Frenchman with Mr. Dorion, the Sioux interpreter, to the camp with directions to invite the principal chiefs to council with us at a bluff above, called the Calumet. Two of those Indians accompanied them, and the third continued in the boat showing an inclination to continue. This boy is a Maha, and informs that his nation were gone to the Pawnees to make a peace with that nation. Set out under a stiff breeze from the south, and proceeded on past a willow island at two miles. Several sand bars. The river wide and shallow. At four miles passed a short white bluff of about 70 or 80 feet high. Below this bluff the prairie rises gradually from the water, back to the height of the bluff, which is on the starboard side. Here the Indian who was in the boat returned to the Sioux camp on the riverJacques. Captain Lewis and myself much indisposed owing to some cause for which we cannot account. One of the pirogues ran a snag through her and was near sinking, in the opinions of the crew. We came to below the Calumet bluff and formed a camp in a beautiful plain near the foot of the high land, which rises with a gradual ascent near this bluff. I observe more timber in the valleys and on the points than usual. The pirogue which was injured, I had unloaded, and the loading put into the other pirogue, which we intended to send back, and changed the crew. After examining her and finding that she was unfit for service, determined to send her back by the party. Some load which was in the pirogue much injured. The wind blew hard this afternoon from the south. J. Shields and J. Field, who were sent back to look for Shannon and the horses, joined us and informed that Shannon had the horses ahead and that they could not overtake him. This man not being a first-rate hunter, we determined to send one man in pursuit of him, with some provisions. The commanding officers direct that the two messes who form the crews of the pirogues shall select each one man from their mess for the purpose of cooking, and that these cooks, as well as those previously appointed to the messes of the barge crew, shall in future be exempted from mounting guard, or any detail for that duty. They are therefore no longer to be held on the roster. Some rain last night and this morning. Sent on Colter with provisions in pursuit of Shannon. Had a tow rope made of elkskin. I am much engaged in writing. At four o'clock, P.M., Sergeant Pryor and Mr. Dorion, with five chiefs and about 70 men and boys, arrived on the opposite side. We sent over a pirogue, and Mr. Dorion and his son, who was trading with the Indians, came over with Sergeant Pryor, and informed us that the chiefs were there. We sent Sergeant Pryor and young Mr. Dorion with some tobacco, corn, and a few kettles for them to cook in, with directions to inform the chiefs that we would speak to them tomorrow. Those Indians brought with them, for their own use, 2 elk and 6 deer, which the young men killed on the way from their camp, twelve miles distant. Sergeant Pryor informs me that when they came near the Indian camp, they were met by men with a buffalo robe to carry them. Mr. Dorion informed they were not the owners of the boats and did not wish to be carried. The Sioux's camps are handsome-of a conic form, covered with buffalo robes painted different colors, and all compact and handsomely arranged, covered all around. An open part in the center for the fire, with buffalo robes. Each lodge has a place for cooking, detached. The lodges contain from ten to fifteen persons. A fat dog was presented as a mark of their great respect for the party, of which they partook heartily, and thought it good and well flavored. A very thick fog this morning. After preparing some presents for the chiefs, which we intended to make by giving medals, and finishing a speech which we intended to give them, we sent Mr. Dorion in a pirogue for the chiefs and warriors, to a council under an oak tree, near where we had a flag flying on a high flagstaff. At 12 o'clock we met, and Captain Lewis delivered the speech; and then made one great chief by giving him a medal and some clothes; one second chief and three third chiefs; in the same way. They received those things with the goods and tobacco with pleasure. To the grand chief we gave a flag, and the parole [certificate] and wampum with a hat and chief's coat. We smoked out of the pipe of peace, and the chiefs retired to a bower, made of bushes by their young men, to divide their presents, and smoke, eat, and council. Captain Lewis and myself retired to dinner, and to consult about other measures. Mr. Dorion is much displeased that we did not invite him to dine with us-which he was sorry for afterward. The Sioux are a stout, bold-looking people; the young men handsome and well made. The greater part of them make use of bows and arrows. Some few fusees [rifles] I observe among them, notwithstanding they live by the bow and arrow. They do not shoot so well as the northern Indians. The warriors are very much decorated with paint, porcupine quills and feathers, large leggings and moccasins-all with buffalo robes of different colors. The squaws wore petticoats and a white buffalo robe with the black hair turned back over their necks and shoulders. After the Indians got their breakfast, the chiefs met and arranged themselves in a row, with elegant pipes of peace all pointing to our seats. We came forward, and took our seats. The great chief, The Shake Hand, rose, and spoke at some length, approving what we had said, and promising to pursue the advice. Last night the Indians danced until late in their dances. We gave them [threw in to them as is usual] some knives, tobacco, and bells, tape, and binding, with which they were satisfied. We gave a certificate to two men of war, attendants on the chief. Gave to all the chiefs a carrot of tobacco. Had a talk with Mr. Dorion, who agreed to stay and collect the chiefs from as many bands of Sioux as he could this fall, and bring about a peace between the Sioux and their neighbors, &c.
After dinner, we gave Mr. Peter Dorion a commission to act with a flag and some clothes and provisions and instructions to bring about a peace with the Sioux, Mahas, Pawnees, Poncas, Otos, and Missouris, and to employ any trader to take some of the chiefs of each, or as many of those nations as he could, particularly the Sioux, down to Washington. I took a vocabulary of the Sioux language, and the answer to a few queries such as referred to their situation, trade, number, war, &c. This nation is divided into twenty tribes, possessing separate interests. Collectively, they are numerous-say from two to three thousand men. Their interests are so unconnected that some bands are at war with nations with which other bands are on the most friendly terms. 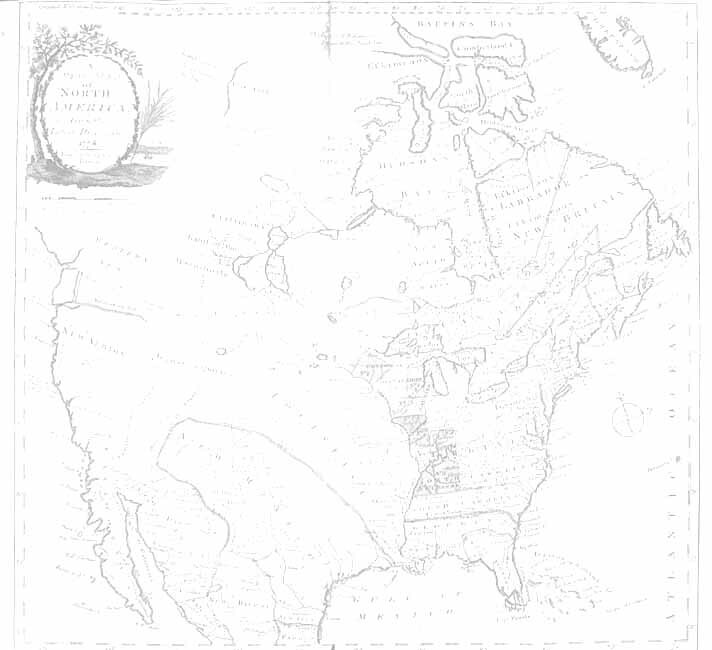 This great nation, whom the French have given the nickname of Sioux, call themselves Dakota-Darcotar. Their language is not peculiarly their own, they speak a great number of words which are the same in every respect with the Maha, Ponca, Osage, and Kansas, which clearly proves that those nations, at some period not more than a century or two past, are of the same nation. Those Darcotars, or Sioux, inhabit or rove over the country on the Red River of Lake Winnipeg, St. Peters, and the west of the Mississippi, above Prairie du Chien, head of River Des Moines, and the Missouri and its waters on the N. side for a great extent. They are only at peace with eight nations, and, agreeable to their calculation, at war with twenty-odd. Their trade comes from the British, except this band and one on Des Moines who trade with the traders of St. Louis. The Sioux rove and follow the buffalo, raise no corn or anything else, the woods and prairies affording a sufficiency. They eat meat, and substitute the ground potato, which grows in the plains, for bread. In the evening, late, we gave Mr. Dorion a bottle of whiskey, and he, with the chiefs, and his son, crossed the river and camped on the opposite bank. Soon after night, a violent wind from the N.W. with rain. The rain continued the greater part of the night. The river a-rising a little. Set out early. The wind blew hard from the south. Goats, turkeys seen today. Passed a large island. Opposite this island near the head, the Ponca River comes into the Missouri from the west. This river is about 30 yards wide. Dispatched two men to the Ponca village, situated in a handsome plain on the lower side of this creek, about two miles from the Missouri. The Ponca nation is small and, at this time, out in the prairies hunting the buffalo. One of the men sent to the village killed a buffalo in the town, the other a large buck near it. Some sign of the two men who are ahead. A very cold morning. Wind S.E. Set out at daylight. We landed after proceeding 5 1/2 miles, near the foot of a round mountain, which I saw yesterday, resembling a dome. Captain Lewis and myself walked up to the top, which forms a cone and is about 70 feet higher than the high lands around it. The base is about 300 feet. In descending this cupola, discovered a village of small animals that burrow in the ground. (Those animals are called by the French petit chien) Killed one, and caught one alive, by pouring a great quantity of water in his hole. We attempted to dig to the beds of one of those animals. After digging 6 feet, found, by running a pole down, that we were not halfway to his lodge. We found 2 frogs in the hole, and killed a dark rattlesnake near with a ground rat [or prairie dog] in him. Those rats are numerous. The village of those animals covered about 4 acres of ground on a gradual descent of a hill, and contains great numbers of holes on the top of which those little animals sit erect, and make a whistling noise, and, when alarmed, step into their hole. We poured into one of the holes 5 barrels of water without filling it. Those animals are about the size of a small squirrel, shorter [or longer] and thicker, the head much resembling a squirrel in every respect, except the ears, which are shorter. His tail like a ground squirrel, which they shake, and whistle when alarmed. The toenails long. They have fine fur and the longer hair is gray. It is said that a kind of lizard, also a snake, resides with those animals. [Did not find this correct.] Camped. Set out at sunrise, and proceeded on past the head of the island, on which we camped. Passed three sand and willow islands. The sand bars so numerous, it is not worth mentioning them. The river shoal or shallow. Wind S.E. Came to and camped on a sand bar on the L.S. Captain Lewis went out to kill a buffalo. I walked on shore all this evening with a view to kill a goat or some prairie dogs. In the evening after the boat landed, I directed my servant, York, with me, to kill a buffalo near the boat, from a number then scattered in the plains. I saw at one view, near the river, at least 500 buffalo. Those animals have been in view all day, feeding in the plains on the L.S. Every copse of timber appears to have elk or deer. D. killed 3 deer, I killed a buffalo, York 2, R. Fields one. A cloudy, dark morning. Set out early, a gentle breeze from the S.E. Passed two small islands on the L.S., and one on the S.S. all in the first course at l01/2 miles. Passed the lower point of an island covered with red cedar, situated in a bend on the L.S. This island is about 2 miles in length. Below this on a hill on the L.S. we found the backbone of a fish, 45 feet long, tapering to the tail. Some teeth, &c. Those joints were separated, and all petrified. Opposite this island, 1 1/2 miles from the river on the L.S., is a large salt spring of remarkably salt water. One other, high up the hill, 1/2 mile, not so salt. We proceeded on, under a stiff breeze. Three miles above Cedar Island, passed a large island on the S.S. No water on that side. Several elk swam to this island. Passed a small island near the center of the river, of a mile in length, and camped on one above, separated from the other by a narrow channel. Those islands are called Mud Islands. The hunters killed 3 buffalo and one elk today. The river is falling a little. Great number of buffalo and elk on the hillside, feeding. Deer scarce. A cloudy morning. Set out very early. The river wide, and shallow; the bottom narrow, and the river crowded with sand bars. Passed the island on which we lay, at one mile. Passed three islands-one on the L.S., and two on the S.S. Opposite the island on the L.S., I saw a village of barking squirrels [prairie dogs], 970 yards long and 800 yards wide, situated on a gentle slope of a hill. Those animals are numerous. I killed four, with a view to have their skins stuffed. Here, the man who left us with the horses, 22  days ago, George Shannon-he started 26th August, and has been ahead ever since-joined us, nearly starved to death. He had been twelve days without anything to eat but grapes and one rabbit, which he killed by shooting a piece of hard stick in place of a ball. This man, supposing the boat to be ahead, pushed on as long as he could. When he became weak and feeble, determined to lay by and wait for a trading boat, which is expected, keeping one horse for the last recourse. Thus a man had like to have starved to death in a land of plenty for the want of bullets or something to kill his meat. We camped on the L.S., above the mouth of a run. A hard rain all the afternoon, and most of the night, with hard wind from the N.W. I walked on shore the fore part of this day, over some broken country, which continues about three miles back, and then is level and rich-all plains. I saw several foxes, and killed an elk and 2 deer, and squirrels. The men with me killed an elk, 2 deer, and a pelican. This morning set out at an early hour and came to at 1/2 after 7 A.M. on the larboard shore 11/4 mile above the mouth of a small creek which we named Corvus, in consequence of having killed a beautiful bird of that genus near it. We concluded to lay by at this place the balance of this day and the next, in order to dry our baggage, which was wet by the heavy showers of rain which had fallen within the last three days, and also to lighten the boat by transferring a part of her lading to the red pirogue, which we now determined to take on with us to our winter residence, wherever that might be. While some of the men were employed in the necessary labor, others were dressing skins, washing and mending their clothes, &c.
Captain Clark and myself killed each a buck immediately on landing, near our encampment. The deer were very gentle and in great numbers in this bottom, which had more timber on it than any part of the river we had seen for many days past, consisting of cottonwood, elm, some different ash, and a considerable quantity of a small species of white oak, which was loaded with acorns of an excellent flavor, having very little of the bitter roughness of the nuts of most species of oak. The leaf of this oak is small, pale green, and deeply indented. It seldom rises higher than thirty feet, is much branched; the bark is rough and thick, and of a light color. The cup which contains the acorn is fringed on its edges, and embraces the nut about one-half. The acorns were now falling, and we concluded that the number of deer which we saw here had been induced thither by the acorns, of which they are remarkably fond. Almost every species of wild game is fond of the acorn-the buffalo, elk, deer, bear, turkeys, ducks, pigeons, and even the wolves feed on them. We sent three hunters out who soon added eight deer and two buffalo to our stock of provisions. The buffalo were so poor that we took only the tongues, skins, and marrow bones. The skins were particularly acceptable as we were in want of a covering for the large pirogue to secure the baggage. Having for many days past confined myself to the boat, I determined to devote this day to amusing myself on shore with my gun, and view the interior of the country lying between the river and the Corvus Creek. Accordingly, before sunrise, I set out with six of my best hunters, two of whom I dispatched to the lower side of Corvus Creek, two with orders to hunt the bottoms and woodland on the river, while I retained two others to accompany me in the intermediate country. One quarter of a mile in rear of our camp, which was situated in a fine open grove of cottonwood, passed a grove of plum trees, loaded with fruit and now ripe. Observed but little difference between this fruit and that of a similar kind common to the Atlantic states. The trees are smaller and more thickly set. This forest of plum trees garnish a plain about 20 feet more elevated than that on which we were encamped. This plain extends back about a mile to the foot of the hills one mile distant, and to which it is gradually ascending. This plain extends with the same breadth from the creek below to the distance of nearly three miles above, parallel with the river, and it is entirely occupied by the burrows of the barking squirrel heretofore described. This animal appears here in infinite numbers. And the shortness and verdure of grass gave the plain the appearance, throughout its whole extent, of beautiful bowling green in fine order. Its aspect is S.E. A great number of wolves of the small kind, hawks and some polecats were to be seen. I presume that those animals feed on this squirrel. Found the country in every direction, for about three miles, intersected with deep ravines and steep irregular hills 100 to 200 feet high. At the tops of these hills, the country breaks off as usual into a fine level plain extending as far as the eye can reach. From this plain I had an extensive view of the river below, and the irregular hills which border the opposite sides of the river and creek. The surrounding country had been burnt about a month before, and young grass had now sprung up to a height of 4 inches, presenting the live green of the spring; to the west a high range of hills stretch across the country from N. to S., and appeared distant about 20 miles. They are not very extensive, as I could plainly observe their rise and termination. No rock appeared on them, and the sides were covered with verdure similar to that of the plains. This scenery, already rich, pleasing, and beautiful, was still further heightened by immense herds of buffalo, deer, elk, and antelopes, which we saw in every direction, feeding on the hills and plains. I do not think I exaggerate when I estimate the number of buffalo which could be comprehended at one view to amount to 3,000. My object was, if possible, to kill a female antelope, having already procured a male. I pursued my route on this plain to the west, flanked by my two hunters, until eight in the morning, when I made the signal for them to come to me, which they did shortly after. We rested ourselves about half an hour, and regaled ourselves on half a biscuit each, and some jerks of elk, which we had taken the precaution to put in our pouches in the morning before we set out, and drank of the water of a small pool, which had collected on the plain from the rains which had fallen some days before. We had now, after various windings in pursuit of several herds of antelope which we had seen on our way, made the distance of about eight miles from our camp. We found the antelope extremely shy and watchful, insomuch that we had been unable to get a shot at them. When at rest they generally select the most elevated point in the neighborhood, and as they are watchful and extremely quick of sight, and their sense of smelling very acute, it is almost impossible to approach them within gunshot. In short, they will frequently discover, and flee from, you at the distance of three miles. I had this day an opportunity of witnessing the agility and the superior fleetness of this animal which was to me really astonishing. I had pursued and twice surprised a small herd of seven. In the first instance they did not discover me distinctly, and therefore did not run at full speed, though they took care before they rested to gain an elevated point where it was impossible to approach them under cover, except in one direction, and that happened to be in the direction from which the wind blew toward them. Bad as the chance to approach them was, I made the best of my way toward them, frequently peeping over the ridge with which I took care to conceal myself from their view. The male, of which there was but one, frequently encircled the summit of the hill on which the females stood in a group, as if to look out for the approach of danger. I got within about 200 paces of them when they smelled me and fled. I gained the top of the eminence on which they stood as soon as possible, from whence I had an extensive view of the country. The antelopes, which had disappeared in a steep ravine, now appeared at the distance of about three miles on the side of a ridge which passed obliquely across me, and extended about four miles. So soon had these antelopes gained the distance at which they had again appeared to my view, I doubted at first that they were the same that I had just surprised, but my doubts soon vanished when I beheld the rapidity of their flight along the ridge before me. It appeared rather the rapid flight of birds than the motion of quadrupeds. I think I can safely venture the assertion that the speed of this animal is equal, if not superior, to that of the finest blooded courser. At half-past one o'clock this morning the sand bar on which we camped began to undermine arid give way, which alarmed the sergeant on guard. The motion of the boat awakened me. I got up and by the light of the moon observed that the sand had given way both above and below our camp, and was falling in fast. I ordered all hands on, as quick as possible, and pushed off. We had pushed off but a few minutes before the bank, under which the boat and pirogues lay, gave way, which would certainly have sunk both pirogues. By the time we made the opposite shore, our camp fell in. We made a second camp for the remainder of the night, and at daylight proceeded on to the gorge of this great bend, and breakfast. We sent a man to measure (step off) the distance across the gorge. He made it 2,000 yards. The distance around is 30 miles. The hills extend through the gorge and are about 200 feet above the water. In the bend as also the opposite sides, both above and below the bend, is a beautiful inclined plain, in which there are great numbers of buffalo, elk, and goats in view, feeding and sipping on those plains. Grouse, larks, and the prairie bird are common in those plains. We proceeded on, past a willow island below the mouth of a small river, called Tylor's River, about 35 yards wide, which comes in on the L.S. 6 miles above the gorge of the bend. At the mouth of this river, the two hunters ahead left a deer and its skin, also the skin of a white wolf. We observe an immense number of plover of different kinds collecting and taking their flight southerly; also brants, which appear to move in the same direction. The catfish are small and not so plenty as below. The shore on each side is lined with hard rough gulley stones of different sizes, which have rolled from the hills and out of small brooks. Cedar is common here. This day is warm. The wind, which is not hard, blows from the S.E. We camped at the lower point of the Mock Island on the S.S. This now connected with the mainland; it has the appearance of once being an island detached from the mainland, covered with tall cottonwood. We saw some camps and tracks of the Sioux which appear to be old, three or four weeks ago. One Frenchman, I fear, has got an abscess on his thigh. He complains very much. We are making every exertion to relieve him. The prairies in this quarter contain great quantities of prickly pears. Passed an island situated nearest the S.S., immediately above the last, called Cedar Island. This is about 1 l/2 miles long and nearly as wide, covered with cedar. On the south side of this island, Mr. Loisel, a trader from St. Louis, built a fort of cedar and a good house, to trade with the Sioux, and wintered last winter. About this fort, I observed a number of Indian camps in conical form. They fed their horses on cotton limbs, as it appears. Here, our hunters joined us, having killed two deer and a beaver. They complain much of the mineral substances in the barren hills, over which they passed, destroying their moccasins. We proceeded on, and camped late on the S. side, below a small island in the bend S.S., called Goat Island. The large stones which lay on the sides of the banks in several places, lay some distance in the river, under the water, and are dangerous. I walked out this evening and killed a fine deer. The mosquitoes are very troublesome in the bottoms.